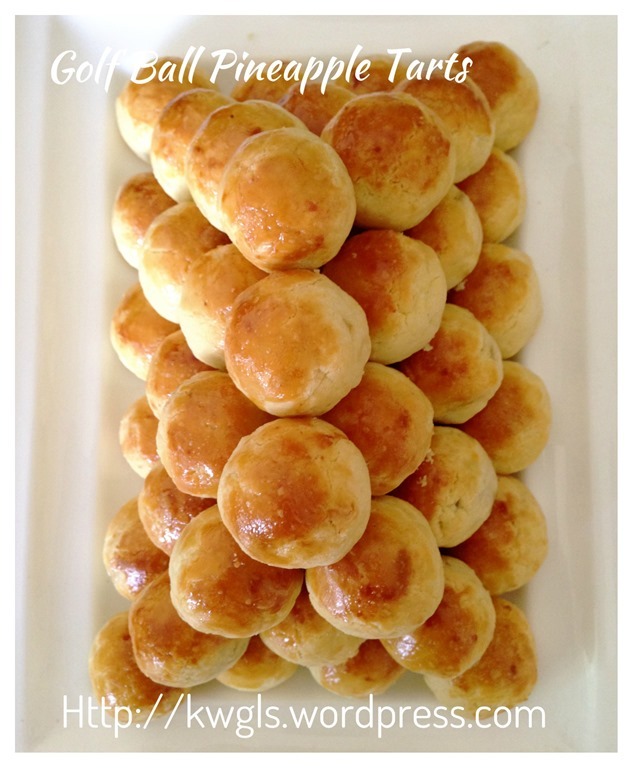 I have decided to rewrite the procedure of this golf ball pineapple tarts as the first post : What A Golf Ball Have To Do With A Pineapple? 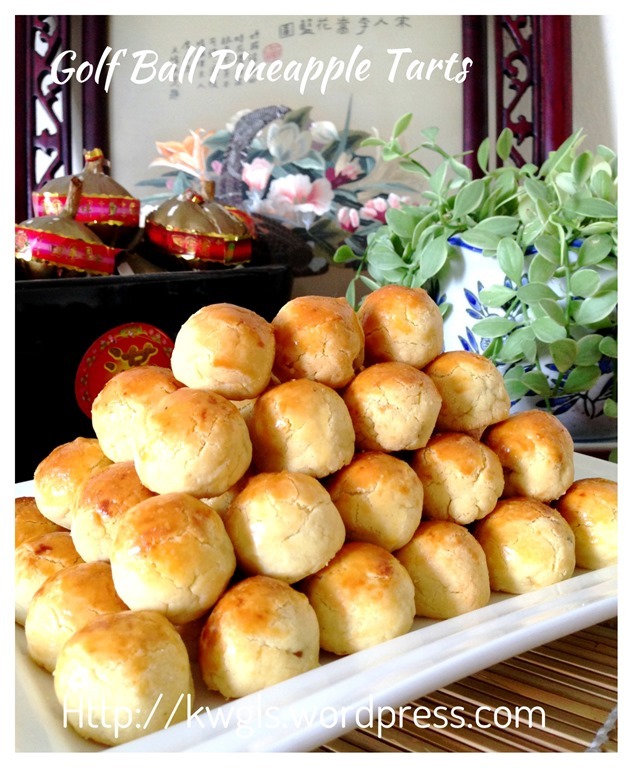 Well, It Is The Famous South East Asian Pineapple Tarts (凤梨酥） was too detailed and readers may be confused. Therefore, this post have summarized the procedures for easy reference. 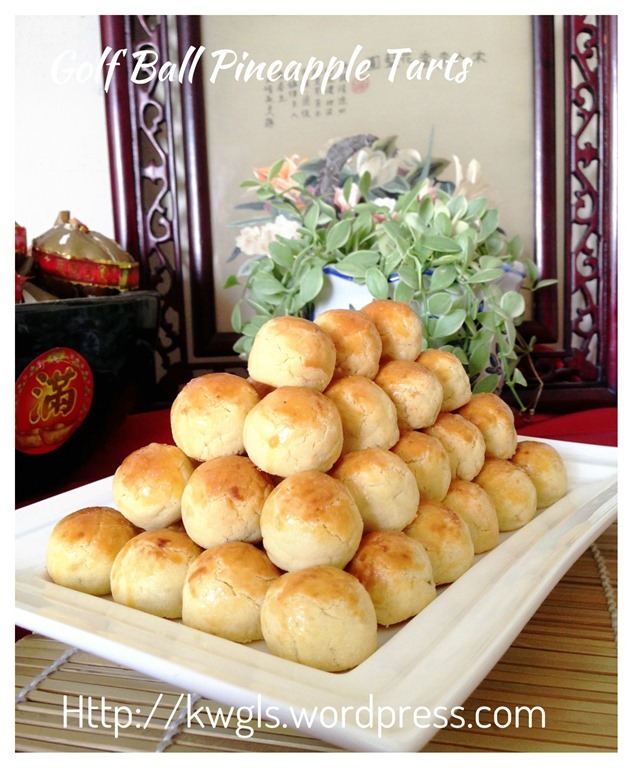 For more write up on pineapple tarts and detail explanation of the procedures and the vegetarian pineapple tarts, please refer to the above post. Take some jam of about 10 grams and shape it round. Arrange it in a container to be stored in the freezer later. The jam may be sticky and if it is overly sticky, pat your hands with some water before the shaping. Once done, deep freeze for 1-2 hours or until you feel comfortable to handle. Do not worry if the dough is too too hard, it will start to turn soft in the subsequent step and start defrosting while you are shaping the others. if you are able to handle the soft jam, deep freezing step is optional.. Cream the butter and sugar until light and fluffy. Add egg yolks one by one and beat until well combined. Sift in the flour in three phases and alternate with icy cold water until well mixed. Chill the dough in the fridge if it is too soft for you to handle. This step is optional if you are able to handle a soft dough. Pinch a dough of about 10 grams each, shape round, lightly flatten it, put a pineapple jam ball on top of the dough, seal the edges and shape round again. 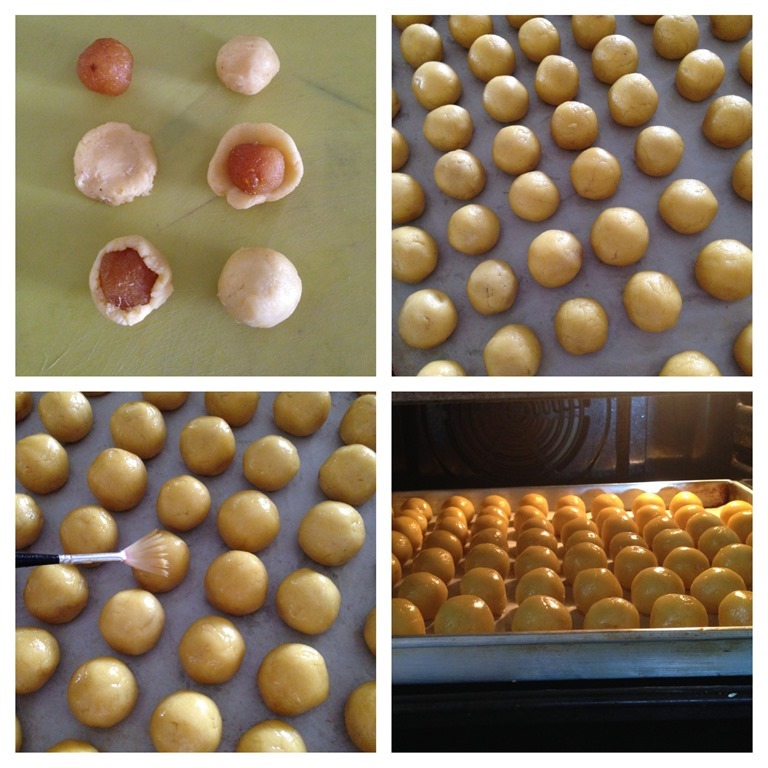 Egg wash the pineapple tarts before baking in the pre-heated oven of 180 degree Celsius for about 20 minutes. If you prefer, you can have the second egg wash after 10 minutes of baking. It will help to repair cracks. Cracks will arises if the dough is too thin. 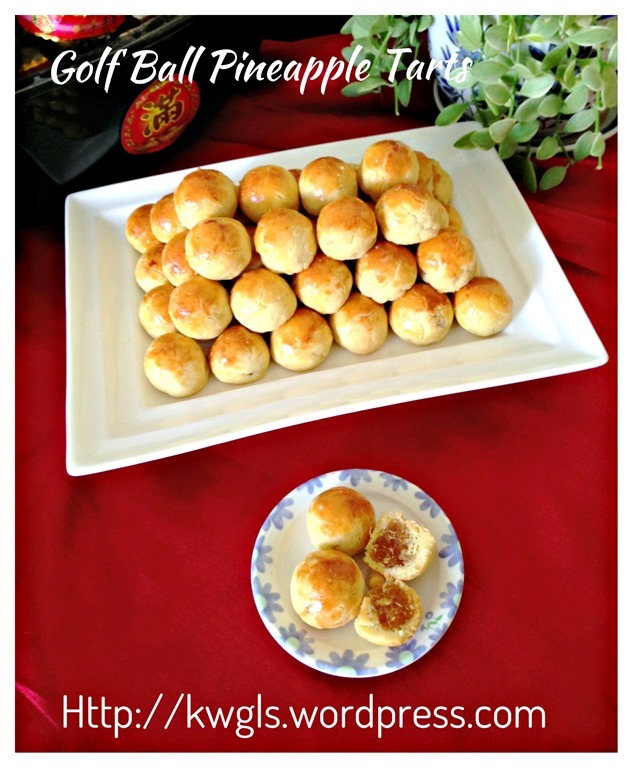 Remember that this is the simplify recipe for the golf ball pineapple tarts recipe. Please refer to the original post for more elaborate explanation. 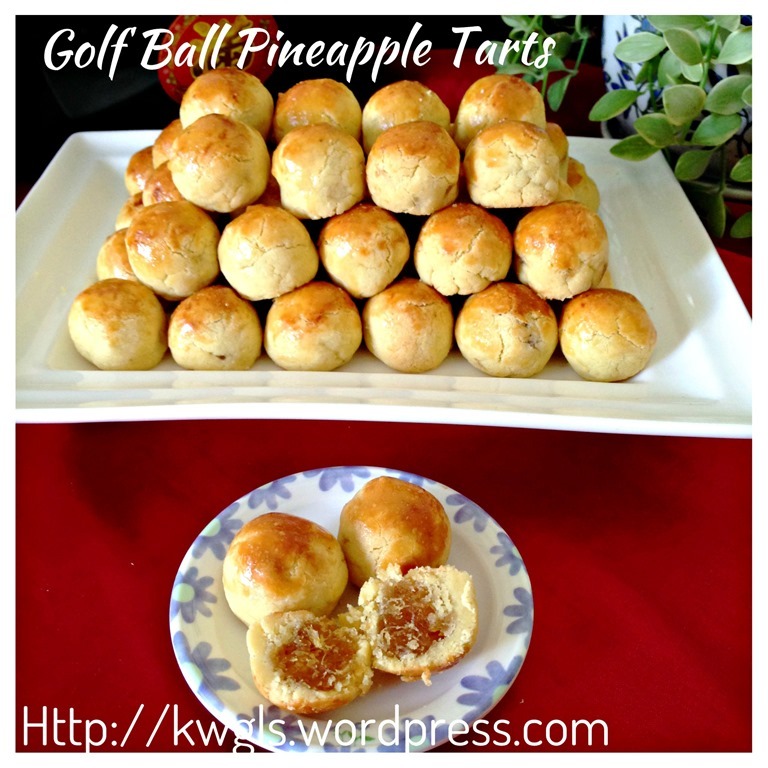 – What A Golf Ball Have To Do With A Pineapple? 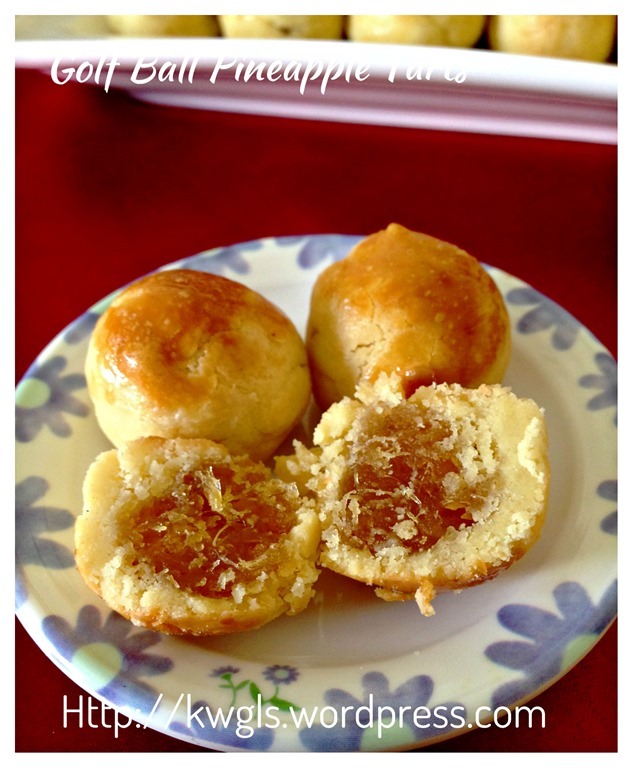 Well, It Is The Famous South East Asian Pineapple Tarts (凤梨酥） and if you need homemade pineapple jam, please refer to this post – Quick and Easy 30 minutes Homemade Pineapple Jam (30 分钟简易凤梨酱）. 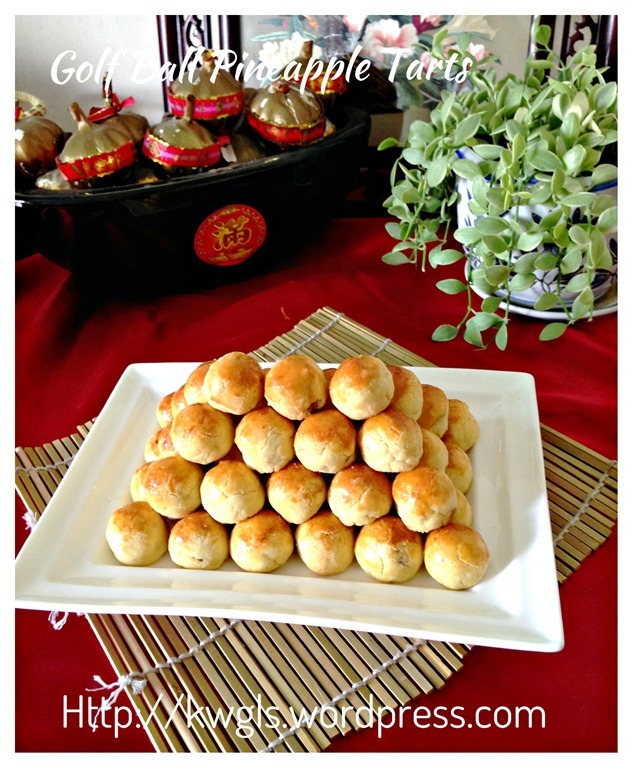 Lastly, if you need pure vegetarian pineapple tarts recipe, you can refer the same post also. This recipe was included in Page 34 and Page 35 of the following E-book. 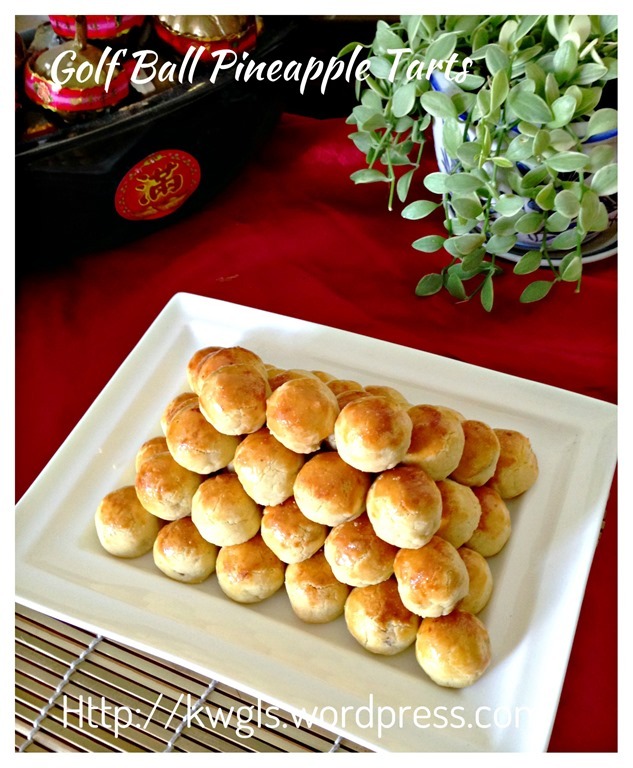 This entry was posted in Cakes and cookies, Chinese and Asian Cakes and Snacks, Chinese New Year 2014, Christmas 2013, Food Preparation Series and tagged 8，postaday, golf ball pineapple tarts, GUAI SHU SHU, Guaishushu, kenneth goh, Nastar, pineapple tarts. Bookmark the permalink.